New Delhi, 28 August 2017|Younis Sideeq Wani: Justice Mishra was sworn in as 45th Chief Justice of India on Monday. He was administered oath of the office by President Ram Nath Kovind. 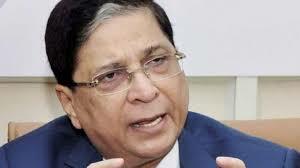 64 year old Justice Mishra is the senior most judge of the Supreme Court after Justice Khehar. He will be the third person from Odisha to be appointed as Chief Justice of India after Justice Raganath Misra and Justice G B Pattanaik. He is succeeding Justice J S khehar, who retired as CJI on Sunday. He Will have a tenure of a little over a year and will retire on October 2nd.